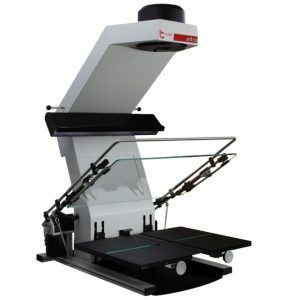 The book2net ultra II has established itself worldwide as a successful product in the field of A2+ production scanners. 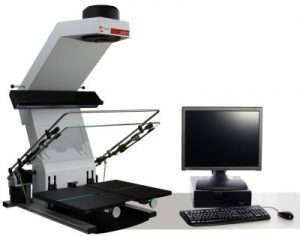 Designed for use in the service sector as well as for reproduction and digitization centers the book2net ultra II meets the specific requirements of high throughput, excellent quality and extreme durability. Further focal points in the development have been the consideration of conservational, environmental and economic aspects as well as a maximum user-friendliness. Equipped with a high-quality lens, an energy-saving Eco-LED light unit, a self-adjusting motorized book cradle and a self-opening motorized glass plate the book2net ultra II combines impressive productivity and quality with ease of use. The industrial precision components and standards are ensuring longevity and sustainability and allow a smooth, uniform guidance and adjustment of all movable elements. The book cradle, the glass plate and the conservational LED lighting system can be precisely adjusted to different formats and structures of the originals within seconds. Thus a smooth workflow is guaranteed.